Devon in the winter probably isn’t everyone’s idea of a long weekend away, but that’s where eighteen women found themselves on 22nd November 2018. We arrived to a beautiful set of cottages in Witheridge. They were beautifully maintained and gorgeously warm. We were about to have a weekend of deep conversation around hard topics. It was important that the women were fully nourished, and this included food, accommodation and of course, fully nourished souls. Our speakers/facilitators were Elsie Gayle, who spoke on Cultural Safety In Maternity Care, Nicola Goodall, who spoke on Decolonising the Postnatal Period and Mars Lord who talked about Birth Activism – Listening. The retreat came out of a desire to do more than talk, but to begin to change practice and begin to tackle the disparities in the maternal morbidity rates for women of African descent. Amongst the eighteen women gathered were midwives, doulas, nutritionists and yoga teachers. Two had flown in from the United States. We were pleased to welcome Jennie Joseph, founder of the JJ Way, and Nikia Lawson, who shared generously about community giving. The MBRRACE-UK annual report of the Confidential Enquiry into Maternal Deaths and Morbidity published on 1st November 2018 painted a bleak picture. The disparities of the maternal morbidity rates have increased between women of African descent and white women from three to four times more likely, to five times more likely to die due to pregnancy complications, and in the postnatal period. Across the birth world, conversations were started, and some shut down, about why this might be. When systemic, institutional and generational racism were mentioned, there was a lot of defensive posturing and an outpouring of tears and fragility. People were astounded that racism could play any part within the NHS and particularly within maternity. Yet we know, through the work of such women as Elsie Gayle, that the bullying of midwives of African descent is nothing new and something that remains ongoing. We also know that institutional racism plays it’s part in Western society. It is not new information that has suddenly risen. What has happened, however, is that rather than focus in on why these women are dying, and what we can do about it, Facebook groups like Mat Exp have been archived to save the feelings of white women who feel ‘attacked’. Now in fairness to the admins of the group, they claim to have received abusive messages in their inbox. One can’t help but wonder why they didn’t report the messages and block the users rather than archive a group that had been going for some years. Examples like this are why the retreat was necessary and will continue to be necessary. We can no longer wait for our plight to be properly addressed, we have to take action ourselves. I’m not sure that the women knew quite what to expect when they signed up to the Reproductive Justice Retreat. They arrived, unpacked and began to settle in. The gorgeous Gabby Molina of Red Jacks, alongside co-founder Sam Buxton, prepared the first evening meal. There the women received ‘honour’ bags, to thank them for booking onto the retreat and to remind them that self-care is paramount when undertaking this work. Inside those bags were goodies including notebooks by Dorcas Creates, bath salts, a balm, a bath ‘teabag’ of herbs and some of Sam’s ‘Red Jacks Jerk Sauce’. It was important to set the tone of the weekend. Alexandra Wilson led an evening of ceremony and ritual to open the retreat. Here we shared stories of our ancestors, those behind and those before us. Mars Lord then began to lead the ‘introduction game’, where everyone was encouraged to think about how they introduced themselves. The women were spread amongst four cottages and there was much excitement as they began to learn more about one another. There was much laughter heard in that corner of Devon over the weekend. Waking to a cooked breakfast was a joy. We were all well fed with three cooked meals a day. Homemade granola, alongside freshly made sorrel was enough to make anyone leap out of bed. There was yoga before breakfast, for those that were inclined with Arlene Dunkley-Wood, and of course a sauna and swimming pool was available throughout the weekend. Some of the women took long walks in the Devonshire countryside. Knowing that the women were well cared for made the workshops/sessions easier to carry. As I mentioned, they were quite deep and involved. 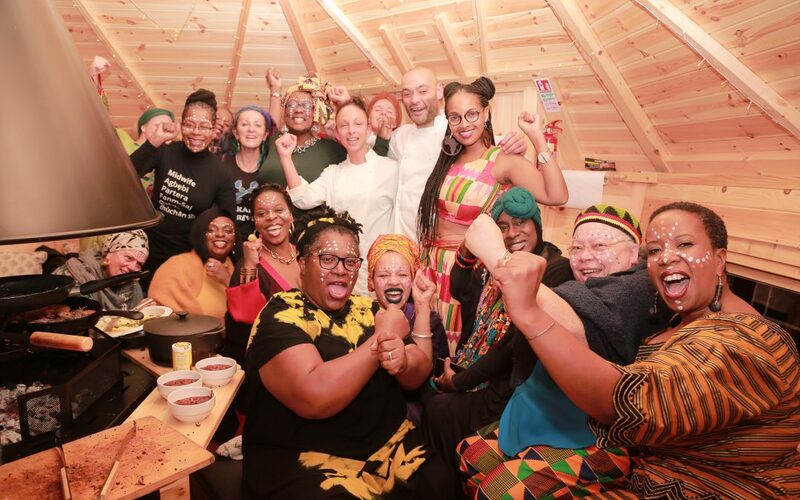 We talked about how it was to be birthkeepers of African descent and people were open and honest in their experiences, and these conversations sprang from the sessions on Cultural Safety (and defining what that looked like) in Maternity and on Decolonising the Postnatal Period. For those who were not of African descent the topics weren’t easy to listen to, but rather than melt into tears, those women began to gain understanding and to talk about what their roles looked like. Bonding together over shared experiences, and not needing to give the disclaimers that are often demanded of us, made sharing easy. Then we talked about the experience of the mothers within the maternity world and our frustrations at the increasing maternal morbidity rates. Then the time for talking about it had to end. It was time to think about how to take action and what changes each of us could make, not only in our practice but within our communities, both online and off. Jennie Joseph shared about the need for perinatal safe spots for parents and babies and the health care providers – midwives, doulas, antenatal educators etc. We began to discuss how these might look and each of us talked through how we might create them. Ideas ranged from a place to breathe and unwind in South Wales, another talked of online hubs, yet another about the work with teenagers that she wished to do. All joining together to be a part of reproductive justice. It was agreed that the retreat had become the first perinatal safe spot for us all. The work would be ongoing for all of us. We ended the weekend with a Women of Wakanda BBQ. The amount of gorgeous glamour that filled the BBQ hut was unparalleled. This was the time to shake off the heaviness of the issues and to invest in some self-care, love and appreciation. The Afro-beats were playing, the food was flowing and the make up and women were looking good. New initiatives have been started by the women on returning home. Passions were fired, a returning doula has stated her aim to dive back in, nutritionists have begun to look at their offerings, a doula who works in mental health is collating stories, and we are looking at the way antenatal education is offered. I will share the offerings of the participants as they come into fruition. It’s hard being home and no longer having chefs to feed us, but the retreat has caused us to lay down new foundations from which to build. There was a sense of something being born on Thursday evening, and many new networks were formed. We decided that the retreats needed to be annual ones, at a minimum, and so plans are afoot for the 2019 retreat and beyond. Do sign up to our newsletter to be kept up to date. My soul feels enriched and I have more women ready to hold up my arms when I get weary. It’s time to get back to work. Perfect this truly captures the weekend. All credit to you Mars. First of many!! Can I have a place on your 2019 retreat please Mars? So disappointed I missed this. I did think that you would enjoy it. I’m in the process of planning and booking it. I launch it at the beginning of January. Mars, this was a ‘culturally safe’ space for deep thinking and solutions seeking. A space of warmth, inclusion and freedom to speak about serious things. Thank you Elsie. And an especial thanks for the footnote. Having witnessed reproductive injustice over the past two decades in Asia, my return to UK and entering the perinatal world, my eyes were opened to racism. I have seen it. I have felt the micro aggresions. I have clients who have told me, glue the police also didnt listen at a time of crisis and she was in danger. The time to act is now. Mars you have painted a picture with your words describing our time there. I was unsure on my way there, but i knew that the fire for justice burning inside was bigger than my insecurity. A group of us talked non stop all the way home on the train to London – its exciting to be a part of this safe spot of champions and its an honour to lift up your arms. It truly was a fabulous weekend. Thank you for organising the retreat Mars, it was wonderful to come together and be able to talk freely wìth other birthkeepers. I’m looking forward to seeing how our work develops as a result of what we learned from each other.